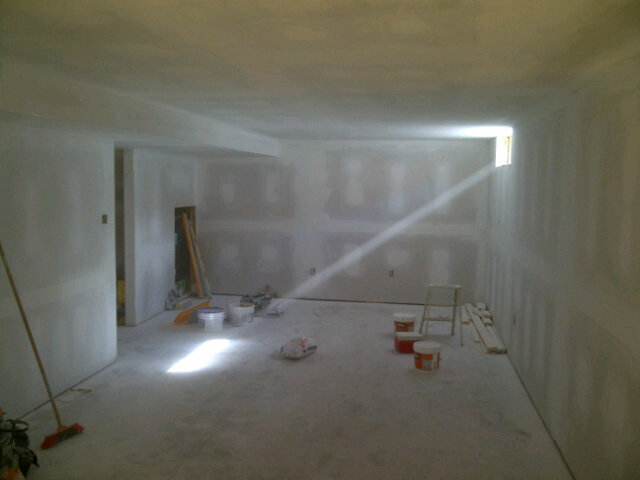 Before: Orleans basement day 1. 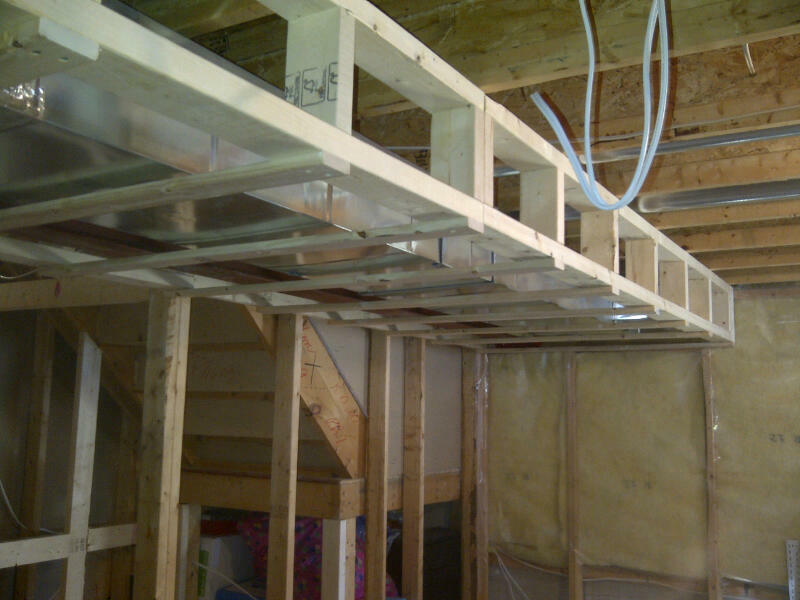 We started a basement renovation in Orleans this week for Sylvie and Ed. I met them through Sarah Kidder, who is the designer on this project. Pictures will be added here as the renovation progresses and you can also follow me on Twitter for daily updates. Day 2: Framed in the ductwork. 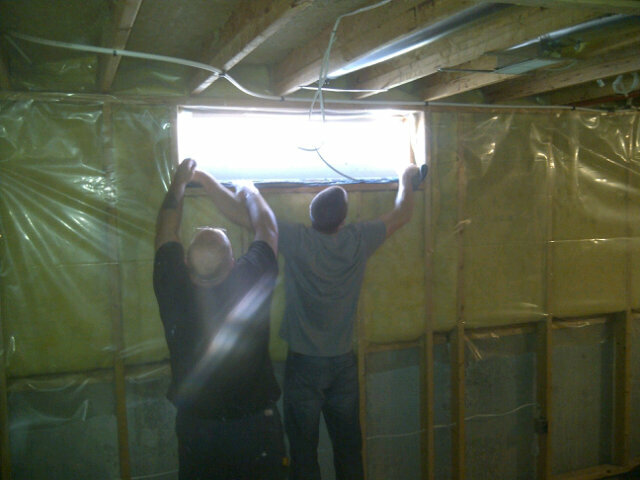 Steve the electrician has also been by. The stairway to the basement turns a couple times, so we tested bringing down one sheet of drywall before placing the huge order. The sheet didn’t fit down the stairs, so we need a plan B. Day 4: Plan B. Took out the basement window to get drywall in. 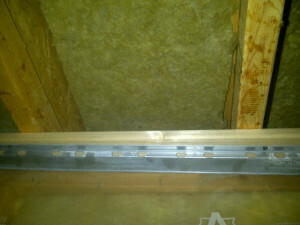 at a right angle to the joist. Day 5. Homeowner Ed plays instruments in the basement, plus we’ve wired for surround sound, so sound insulation is an important part of this reno. As you can tell from the week 1 pictures, we’ve been working above our heads all week. The tools that felt so light Monday felt like they weighed 100lbs or more by the end of Friday. Sylvie kindly sent this email at the end of week 1. I wanted to thank you for all the good work you did for us this week and for your patience and understanding with some of the changes we requested. It has been a real pleasure working with you and your team. 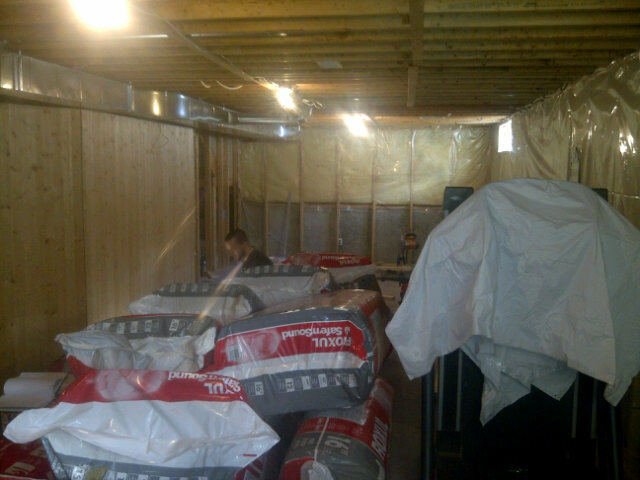 This week it was time to hang, mud, sand and prime drywall — 2,300 square feet to be exact. 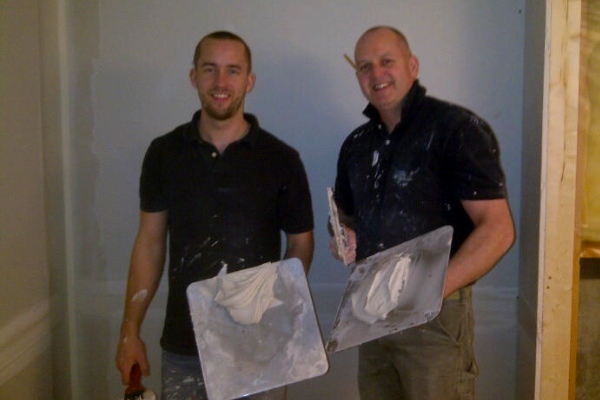 We primed the walls after taking this picture, so colour goes on the walls Tuesday and we’ll be into the final renovation stages. Hope everyone enjoyed Family Day Monday. On Tuesday (Day 11) colour went on the walls. 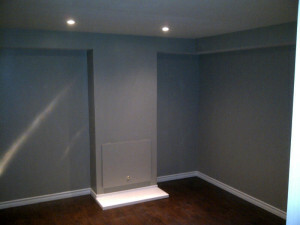 Designer Sarah Kidder chose Benjamin Moore’s Snowfall White (ceiling) and soothing Silver Fox (walls). 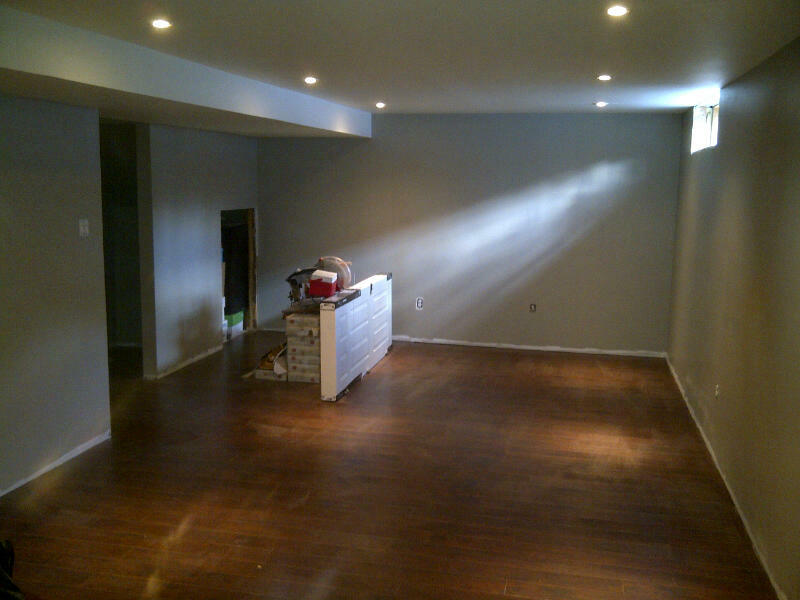 Wednesday we started laying laminate floor while licensed electrician Steve Legallez installed pot lights. The basement is really coming together and there’s much more to come. Welcome to Ed’s music room. 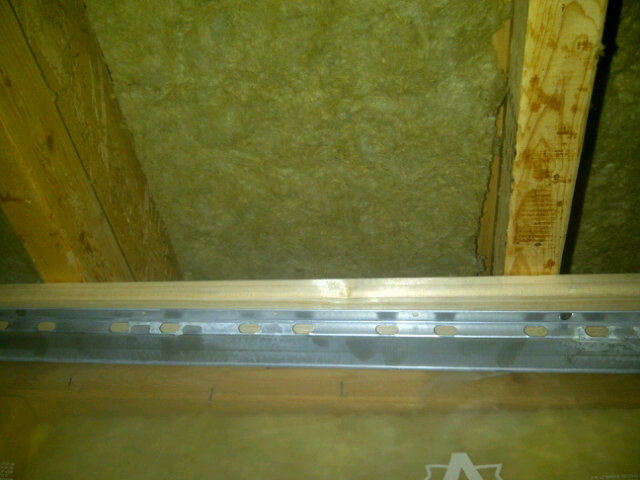 Fully sound insulated. All the finishing touches happened this week, like window trim, baseboard trim, and door under the stairs and much more. 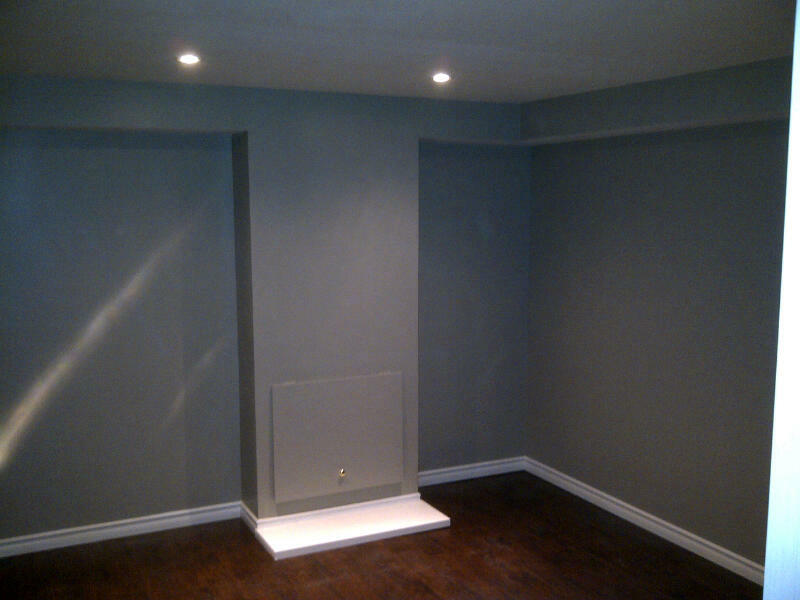 Paul and his team did a great job finishing our basement. It was delivered on time and on budget. We appreciated their willingness to accommodate our requests and their positive attitude throughout the project making sure that everything was up to our standards. We now have a beautiful and comfortable place to relax or play thanks to their hard work!